There is an inherent anxiety to any novel that tries to inhabit the voice of an “other.” Indeed, it can be downright treacherous to write (or read) as someone who experiences the world in a remarkably different way than oneself – across lines of, say, gender, race, or culture. In the case of Aaron Cully Drake’s debut novel, in which the narrator is an adolescent boy with autism, that anxiety of representation is certainly present, but fades quietly into the background, making way for a nuanced and sensitive narrative of conflict, comedy, and trauma. Drake, who blogs about being the parent of an autistic child, does not try to represent the wide array of experiences of autism, but rather constructs one consistent, cohesive, and sometimes confusing protagonist in 17-year-old Freddy. The story is simple enough. After a fight leads to his expulsion from one school, Freddy transfers to another. A few weeks in, he becomes reacquainted with Saskia Stiles, an old friend who represents potential for growth and stability, but who is also the key to the shrouded truth about Freddy’s family and their past. The reader quickly adapts to Freddy’s eccentric narration, and begins to recognize his means of processing the world. Freddy struggles with metaphors and conceptual analogies, poring over Wikipedia to, for instance, confirm that his tormenters at school do not possess characteristics that would define them as a “friend.” With every encounter or conversation, various questions and strategies open up in Freddy’s mind, alternately guiding and dislocating him. Many chapters begin with “Listen,” or “I open my eyes, and …,” locating time and place through direct sensory perception. This is useful, as the story is punctuated by bits about Freddy’s childhood, his mother’s disappearance, and his strained relationship with his father. Drake’s writing is delightful, and the architecture of the book is subtle and effective. Despite any potential misgivings about the ethics of representation – after all, there are writers with autism out there speaking for themselves, which the novel gently acknowledges – Drake remains smart about it. 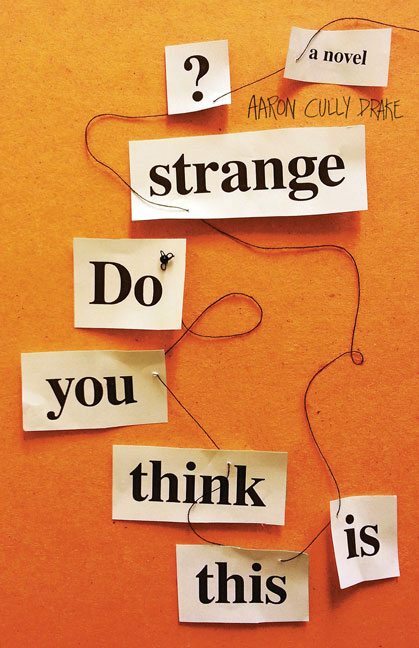 Ultimately, Do You Think This Is Strange? is not simply about a boy with autism, but more importantly about the way those who encounter him (including the reader) choose to respond to him.